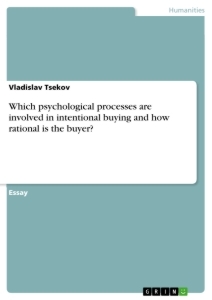 Which psychological processes are involved in intentional buying and how rational is the buyer? Each day we face numerous decisions that determine the outcome of our life to a great extent. Whether we are rich or poor, happy or sad, good or bad - it all comes down to the decisions we make. It is therefore logical to assume that human beings have evolved to be experts in decision making. For decades, Economists, Psychologists and Philosophers have struggled to answer this question by conceptualizing the way people make decision and by coming up with models that explain judgment and decision making (Gigerenzer and Selten, 2002). Over the last few centuries, models of rationality have been constantly changing and evolving. In 1654, Blaise Pascal and Pierre Fermat had a prolonged discussion about human rationale in gambling scenarios, giving birth to the rational choice theory (Hacking, 1975). Its main assumption is that humans take into consideration every available information, cost and benefit associated with a decision and proceed to select the best choice amongst all available alternatives - the one that maximizes Expected Utility. This model, however, is inherently flawed, as it ignores elements such as cognitive biases and mental shortcuts (also known as heuristics) that could lead to deviations from the assumption of perfectly rational decisions (Kahneman, 2003a). In response to the limitations of the rational choice theory, Herbert Simon proposed the notion of bounded rationality to compensate for flaws in human thinking and to take into consideration environmental constraints when making a decision (Simon, 1955). Bounded rationality suggests that humans act as satisficers rather than maximizers, aimed at finding a decision that is good enough, taken the amount of information and time that were available for making the decision (Simon, 1956). This framework applies to any decision making process - including consumer behaviour. Therefore, this essay will argue that consumers are not perfectly rational agents, aimed at maximizing expected utility with each transaction. Rather, humans have inherent limitations to their information processing abilities leading to the development of cognitive biases and heuristics, which help them make decision faster and more efficient. This ability, however, comes at the cost of making suboptimal decision. To illustrate the point and to compare and contrast both models of rationality, we will use a practical example of a car purchase throughout the essay. Lastly, will investigate further factors, both internal and external, which have been shown to have an impact on buying behaviour. Carl would then have the capacity to analyse the entire information and synthesise it into an actionable decision. However, research has shown that this is highly idealistic and non applicable, indicating a considerable deviation from rationality (Kahneman and Tversky, 1982). Buying a new car has received a lot of attention in the consumer research literature. Because of the large purchase price of a new car, one would expect a considerable time investment for external information gathering and a sophisticated decision making processes. Surprisingly, research in consumer behaviour portrays consistent findings that pre-purchase search activity is grossly limited (Beatty and Smith, 1987), contradicting the notion of the rational choice theory. Behavioural economists argue that the rationality concept is deeply flawed, highlighting numerous problems involved with its underlying assumptions (Tversky and Kahneman, 1974). Firstly, the perfectly rational human is presumed to possess knowledge of all relevant aspects in his environment, which, if not absolute complete, is at least astonishingly comprehensive. He is assumed to have a perfectly coordinated system of preferences and outstanding computational capabilities, enabling him to choose an action from a whole multitude, which will “permit him to reach the highest attainable point on his preference scale” (Simon, 1955). This is highly problematic, as no human possesses all the knowledge and information useful for a decision. Also, due to the limited capacity of cognitive processes regarding computational and predictive functions, genuine human rationality can at best be an “extremely crude and simplified approximation” of the perfect rationality that is assumed (Simon, 1955). There is a substantial lack of evidence that complex computations can be performed in the actual process of decision making. It therefore seems quite reasonable to examine the possibility that the decision making process is quite different from the one that the rational choice theory portrays (Simon, 1955). We can therefore conclude with a high degree of certainty that the rational choice theory is not the most useful framework for describing the process of decision making and buyers should not be seen as fully rational agents, aimed at maximizing expected utility. In reality, human beings are quite different. Their cognitive capabilities are limited. Full rationality requires unlimited cognitive capabilities, which contradicts the structure of our brain. For this reason, the decision-making behaviour of human beings cannot conform to the ideal of full rationality (Gigerenzer and Selten, 2002). Herbert Simon (1955) introduced a new concept that challenged the preceding model of human rationality as understood by the rational choice theory. He coined it bounded rationality. According to him, rationality is bounded, as there are always limits to time, our thinking capacity and the information available (Simon, 1982). It offers an alternative framework for exploring the decision making process, which embraces the boundaries of human information processing (Mueller and de Haan, 2009). “ Broadly stated, the task is to replace the global rationality of economic man with a kind of rational behaviour that is compatible with the access to information and the computational capacities that are actually possessed by organisms, including man, in the kinds of environments in which such organisms exist ” (Simon, 1955). The reality is that in most of our day to day lives, we don’t have the full information available to us to make fully informed rational maximizing choices. We live in a world of increasing complexity, information failures and information gaps. A world filled with lots of constraints. According to Herbert Simon (1955), instead of searching for an alternative that maximizes expected utility, humans use a different strategy to compensates for the limits of our brains and the environmental constraints. Simon called this strategy "satisficing" (a combination of satisfy and suffice). In this strategy, the search process goes on until a satisfactory alternative is found that reaches or surpasses an a priori established aspiration level on a specific goal variable, and then this alternative is taken. Good decisions are regarded as such in regards to the costs and constraints involved (Johnson, 2012). Decision-makers in this paradigm perform as satisficers who can only seek a satisfactory solution, lacking the ability and resources to arrive at the optimal one. Instead of doing all the equations and working everything out before they make a choice, people rely on heuristics (Tversky and Kahneman, 1974). Research has provided strong evidence to believe that decision making is influenced by heuristics rather than analytical logical reasoning (Kahneman, 2003a). Judgment and decisions are therefore dependent on a scarce amount of data, strongly influenced by unconscious mental biases (Tversky and Kahneman, 1974). Let us once more explore the case of Carl, who is searching to buy a car with a budget of €10.000 - this time from the perspective of bounded rationality. From it follows that Carl would not be looking to maximize Expected Utility (EU). Instead, he would search through available alternatives until a specific acceptable threshold is met - i.e. he finds a “good enough” alternative that would satisfy his criteria, taking into account the information, time and cognitive resources he has. Carl would look for a satisfactory decision, rather then a maximal one. Because his information and time is limited, we could assume that Carl would limit his criteria for buying a car to only include the most important components: Price, Reliability, Safety and Power. Based on his own preferences, he would set a predetermined cut-off value for each component and start researching information in contemporary car journals. He would then look for an alternative that is Satisfactory (S), taking into account the amount of time invested (time) and the amount of information researched (information). Carl would then proceed to select the first alternative that satisfies all of his predetermined cut-off values.